Christopher Columbus was not the first to discover the Americas, but his voyages led to European exploration of the New World. 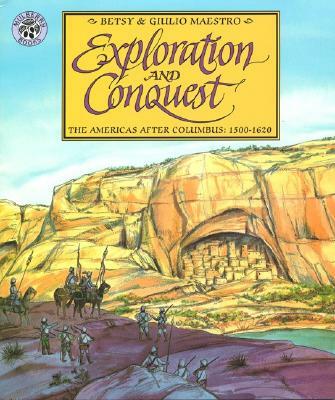 Rich in resources and natural beauty, the Americas were irresistible to gold-hungry conquistadors. The newcomers gave little thought to those who had called the lands their home, and exploration soon came to signify conquest. The New World -- and the lives of its inhabitants -- would be changed forever. Giulio Maestro is the illustrator of over 100 children’s books. He has also written his own books of word play and has co-authored two I Can Read Books with his son, Marco: What Do You Hear When Cows Sing, and Other Silly Riddles and Geese Find the Missing Piece: School Time Riddle Rhymes. The Maestros live in Old Lyme, CT.